Sick tree treatment - aerate the root zone, broadcast ½-1" compost, apply dry molasses or sugar at 5 pounds per 1,000 square feet and lava sand at 80 pounds per 1,000 square feet, mulch with shredded native tree trimmings, and spray foliage at least monthly with Garrett Juice plus garlic tea. Add cornmeal at 20 pounds per 1,000 square feet for additional disease control. 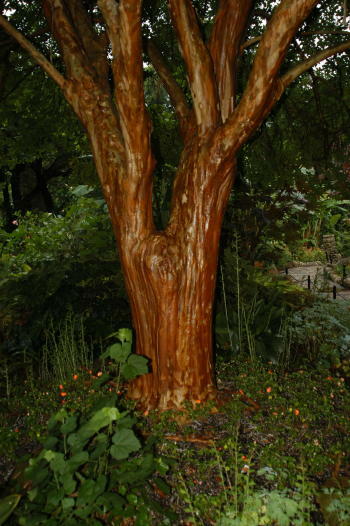 Here is a photo of the crape myrtle in the Sunken Gardens that Bob and I discussed on his show Saturday morning. Hopefully we can convince the Park Department to carefully remove the planting bed from the fantastic root flare and apron that used to be visable. Soil added to this part of the tree is highly detrimental and should be removed with the device called the Air Spade.